I'm sure all my friends from the realm of "real life" are wondering why I haven't posted my crowning achievement yet. Yeah, I have a few real life friends. Don't act so surprised. So yeah. I just made a wedding cake for my friend Kez's wedding. No big deal or anything. There's my fellow bridesmaid licking her raptor claw as she helped me throw the berries on the cake. I actually put the whole cake together that morning and decorated it. It only took like five and a half milliseconds. Luckily I had the foresight to use a very sturdy buttercream frosting that was even sturdier refrigerated so I just put them together like bricks. Not that they tasted like bricks. Actually they were quite fluffy and moist. So here's the cute thing. The groom loves strawberries. So for his first grade birthday party he wanted a strawberry cake. But all the kids made fun of him because, well, big first grade boys don't get pink strawberry cakes. I beg to disagree. Strawberries are for all ages and genders. So I made a strawberry filling and called it a day. I didn't take a picture of a slice, but the inside looked sort of like this. 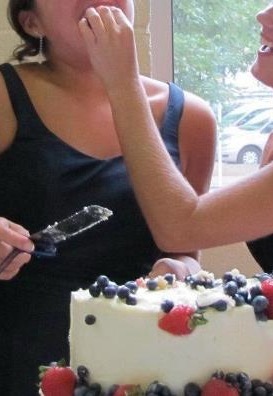 Nemo and I were just too busy cutting the cake like normal people and not being weird at all to worry about pictures. Unfortunately other people were taking pictures. Okay now. If any of you are planning on making a wedding cake anytime ever, let me give you a tip. PLAN AHEAD. I'm glad I did. Allow me to break down the cake schedule for you. This wedding was on a Friday, but I'll write everything down as if it had been on a Saturday since most weddings are. Tuesday: Gather supplies from Hobby Lobby. Make sure you have a presentable stand, a pastry scraper for smoothing frosting, a cake lifter (it looks like a big pastry scraper), large cardboard rounds for storing the layers on before they're assembled, the right sized cake pans, styrofoam layers if you're doing any fake layers (the bottom two layers of mine were frosted styrofoam), and a cake topper. Also make sure you have all your baking ingredients in abundance. Wednesday: Bake cakes, making sure that you wrap them securely in plastic wrap to ensure moistness. I made three 9-inch layers, three 6-inch layers, and three 4 inch layers of fluffy white butter cake. Thursday: Make buttercream. Please make a practice cake to make sure your buttercream won't slide around. This recipe is foolproof and deeeelish (it's similar to the one I used). This recipe is harder but quite incredible and very white. This recipe is hard too, but is absolutely amazing. Friday: Make the filling and fill and frost the cakes and styrofoam rounds (if using). Don't assemble yet. Use a pastry scraper to smooth the edges at the end. At the very end you can wipe the scraper with a wet cloth before you scrape it down to get it especially smooth. Store each layer separately on cardboard rounds or other flat boards. 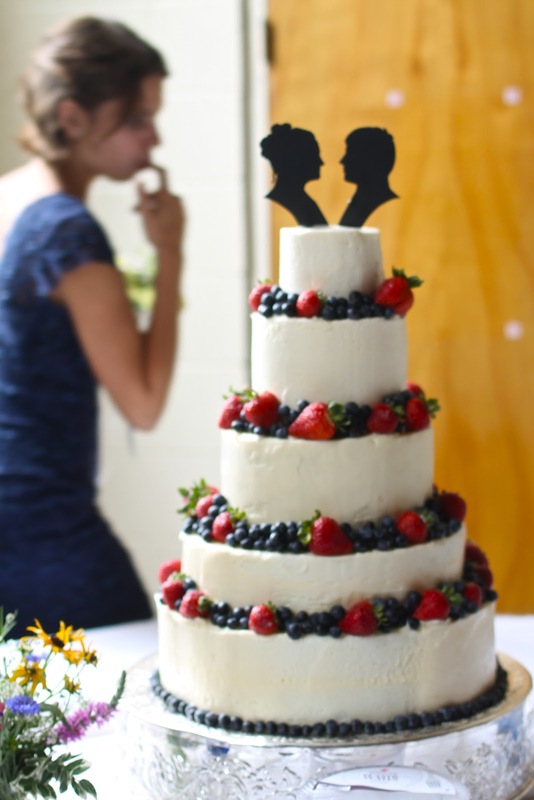 In the wee hours of the morning, after you've gotten home from the rehearsal dinner, feel free to make the cake toppers. I just traced pictures of the bride and groom from my computer on regular white paper and then cut it out on top of the black cardstock with hair cutting scissors. That's how on top of it I was. Saturday morning: The cakes should be easy to lift onto each other if you used one of my good frostings. You should use a cake lifter, but really, if they've been refrigerated long enough, you could practically just lift them on with your bare, raptor clawed hands without leaving a smear in the frosting. Don't do that though. Please. Now you can put some skewers down in them if you're worried about the cake sliding. For me the skewers just got in the way. The cake was solid. 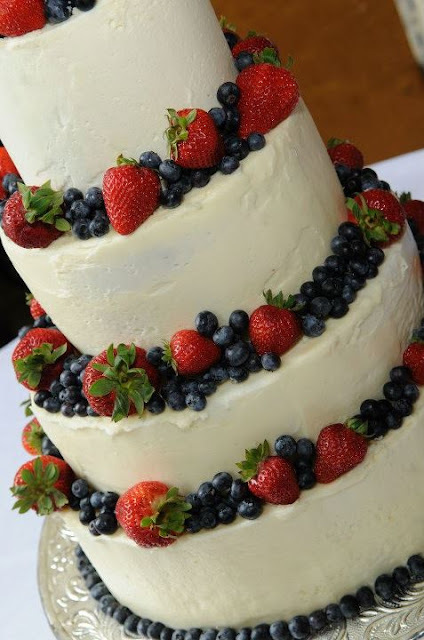 Finally, decorate it simply with berries or fresh flowers unless you're some kind of crazy talented cake decorator. From 10 am to 4 pm was just enough time for the cake to soften to room temperature and the texture was perfect. I hope you liked it, my dear Kez and Aaron. I hope you have an amazing life together and I hope your hair never looks as weird as it did on the cake topper I made for you on that fateful day. This is a basic recipe for two 9-inch layers. You can take it from there. Preheat the oven to 350º. Grease two 9-inch round cake pans and flour or line with parchment. Beat the egg whites and cream of tartar for about two minutes, until soft peaks form, then beat in the 6 tablespoons of sugar. Beat for about 2 minutes, until medium peaks form. Set the whites aside. Beat the butter and remaining 1 1/2 cups of the sugar. Continue whisking about 5 minutes. Whisk in the milk and vanilla. Then sift in the flour, baking powder, and salt. Do not overwork. Whisk in 1/4 of the egg whites to lighten the batter and then fold in the rest. Pour into prepared cake pans. Bake in the prepared cake pans for about 30 minutes or until a toothpick inserted comes out clean. Do not overbake. Cool completely before frosting. In a medium saucepan, cook down the strawberries on medium heat. When they're soft enough, blend with an immersion blender or in a food processor until smooth. Whisk in the sugar and cornstarch until smooth. Return to heat and cook until thickened. Beat together the milk, vanilla, and powdered sugar (add only a little powdered sugar at a time to avoid making a huge mess). Cut the cold butter into small cubes and add a handful at a time. Beat for about 10 minutes until fluffy and smooth. Follow on Facebook, Twitter, and Pinterest if you want.